Home Car Comparisons Tata Tiago vs Maruti Celerio : Which is the best mid-sized hatchback? Tata Tiago vs Maruti Celerio : Which is the best mid-sized hatchback? Tata Tiago vs Maruti Celerio comparison deserves a mention simply because both the cars fall in the affordable hatchback category and both offer a diesel powerplant to consumers who look for cars with low running costs. While Maruti Celerio has already charmed the buyers, the comparatively new kid on the block Tata Tiago has managed to pack in some really nice things to lure the buyers. Read on this extensive Tiago vs Celerio review to find out which one of the two offers a better deal. Both Tiago and Celerio offer the choice between petrol and diesel engine options while Clerio comes with a choice of CNG option too. It is the only car in its segment to offer three fuel choices. Both the cars offer 5-speed manual transmission. There is no AMT on offer on Tata Tiago while Celerio offers 4-speed AMT on its petrol variant. The company might launch AMT version of the car soon. Celerio is offered in as many as twenty-one trims while Tiago is offered in nineteen variants. Tiago gets a bigger wheelbase of 3746mm which is 46mm larger than that of Celerio. It is also the longer one with a length of 1647mm compared to Celerio that is 1600mm long. Celerio is the higher of the two with a height of 1560mm while Tiago makes do with 1535mm. Coming to ground clearance, Tata Tiago again beats Celerio standing 170mm above the ground as compared to Clerio that has a ground clearance of 165mm. Crux: Maruti Celerio has a tall boy design but apart from that it falls short on the dimension front when compared to Tata Tiago. Tata Tiago gets its power from the three cylinder, 1047cc Revotron diesel engine that makes out 67 bhp of power along with 140 Nm of peak torque. It also comes with an option of a 1.2-litre petrol engine that emits 84bhp power along with 114Nm of peak torque. Maruti Celerio is powered by a smaller 0.8-litre diesel unit that offers 47bhp of power and 125Nm of torque. Its petrol version comes equipped with a 1.0-litre motor that develops 67bhp of power and 90 Nm of torque. The lighter diesel mill of Celerio feels faster during in-gear acceleration but that of Tiago is more refined. The petrol engine of Celerio also offers a crisper throttle response and its refinement level is also higher. Crux: If there is one aspect in this Tata Tiago vs Celerio contest in which Tiago lags behind Celerio, it has to be engine performance. Maruti’s drivertrains are hard to match and Celerio proves this point once again. Celerio vs Tiago mileage contest depicts both cars as equals. The petrol and diesel trims of Tata Tiago return 23.84 kmpl and 27.28kmpl of fuel economy respectively. Maruti Suzuki Celerio delivers 23.1kmpl of mileage in the petrol version and 27.62 kmpl in the diesel version. Crux: The mileage figures of both the cars are almost similar and impressive. Tata Tiago has been designed to impress and it sure does. It has a racier and young appeal to it unlike Celerio that looks sober. The latter has a more function dominating form with a tall boy design and sports simple lines. On Tiago you get higher level of detailing and its lines are crisper. It gets some striking design elements like OVRMs with turn indicators, chrome highlights around grille and fog lamps, contrasting black elements on back and front bumper that make it sporty and hence more appealing than Celerio. Celerio gets a typical Maruti front. Thesharp bumper and headlamps lend it a modern look. The prominent shoulder line softens the tall boy stance of the car mildly. While Tiago has a neatly designed rear, Celerio has a rather flat one. Crux: Tata Tiago has a more handsome design and a more aggressive stance than Maruti Suzuki Celerio. It is also nicely proportioned. 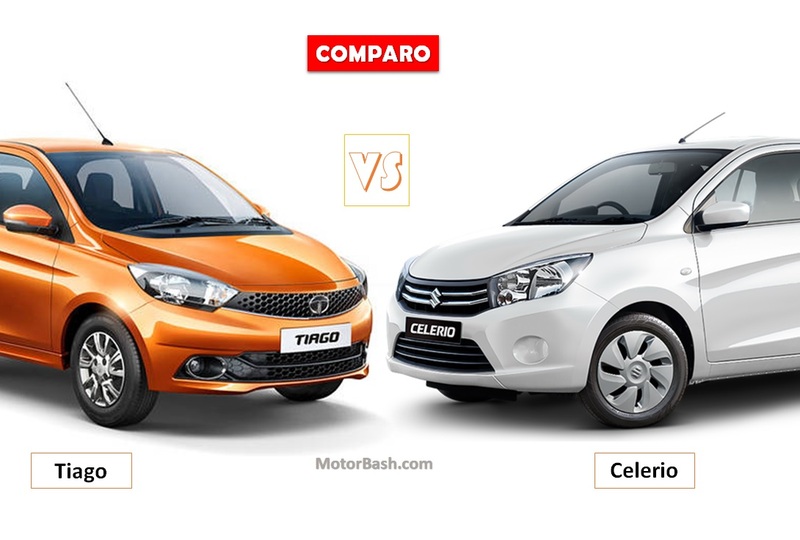 Hence, Tiago vs Celerio exterior comparison is easily won by Tiago. Now let us turn to Tata Tiago vs Celerio interior comparison. Open the door and here again you will find Tiago scoring over Celerio. The cabin of Tata Tiago is well appointed. The layout of the dash and the centre console is appealing. The two-tone dashboard in black and grey looks modern and well finished. The quality of the materials is also good. The contouring on the seats is another highlight. The black upholstery ups the overall feel of the cabin. Celerio with its black and beige colour scheme looks good from the inside as well. But is fails to meet the beauty and class of Tata Tiago. In terms of space too, Tiago trumps Celerio. Rear space and shoulder room offered by Tiago is more than that of Celerio although the latter is taller and offers more headroom. There is not much difference between the boot space of both the cars. It stands at 242mm and 235mm for Tiago and Celerio respectively. Crux: Tata Tiago looks better than Celerio on the inside and also offers more interior space. Tata has left no stone unturned to take on Celerio with a vengeance. It has been packed with numerous interesting features like steering mounted controls, height adjustable driver’s seat, electric adjustment for OVRMs, rear parking sensors, driver information system with range, Command-Next infotainment system, rear wash/wiper with defogger etc. Celerio, when compared to Tiago on the feature aspect disappoints. It does not get any of the features mentioned above. It offers a very basic feature list comprising of features like electric power steering, power windows, integrated audio with Bluetooth connectivity, multi function display, etc. Crux: In terms of feature and equipment list, Tata Tiago vs Maruti Celerio comparison goes in Tiago’s favour. The top specced model of Tata Tiago offers good safety features like dual airbags, ABS with EBD and corner stability control. Celerio also comes with dual airbags and ABS as an options pack on all variants of the car. Both the cars come with other safety features like engine immobiliser, central locking etc. Crux: Tata Tiago vs Maruti Celerio safety comparison lists Tiago as a safer car of the two. Celerio’s K10 engine offers equal power through the rev range and has been combined with one of the best gearboxes in the hatchback segment. It scores over Tiago on engine performance aspect. But when it comes to handling, there is no beating Tiago. The well-tuned chassis of the car along with the new platform makes it one of the best handling cars in the segment. The ride quality offered by Tiago is also quite impressive. It absorbs the irregularities of the road rather well. The suspension of the car is tuned on the softer side that makes it a breeze to rise within the city. The steering offers a good feedback. The suspension of Maruti Suzuki Celerio, on the other hand, obtains a perfect balance between stiff and soft. It offers a fairly settled ride at high speeds. The gearbox offers precise shift action. Crux: The Celerio vs Tiago performance face-off is tilted in the favour of Tiago. When we are talking about modestly priced hatchbacks, it is often the price that is the deciding factor for the buyers. Here is where Tata Tiago comparison to Maruti Celerio boils down to a reveal a clear winner. Tata has priced Tiago quite competitively starting at Rs. 3.20 lakh for the base model and going up to 5.54 lakh for the top end one. Maruti Suzuki Celerio has a higher price tag that falls between Rs. 4.03 lakh and goes up to Rs. 5.90 lakh. 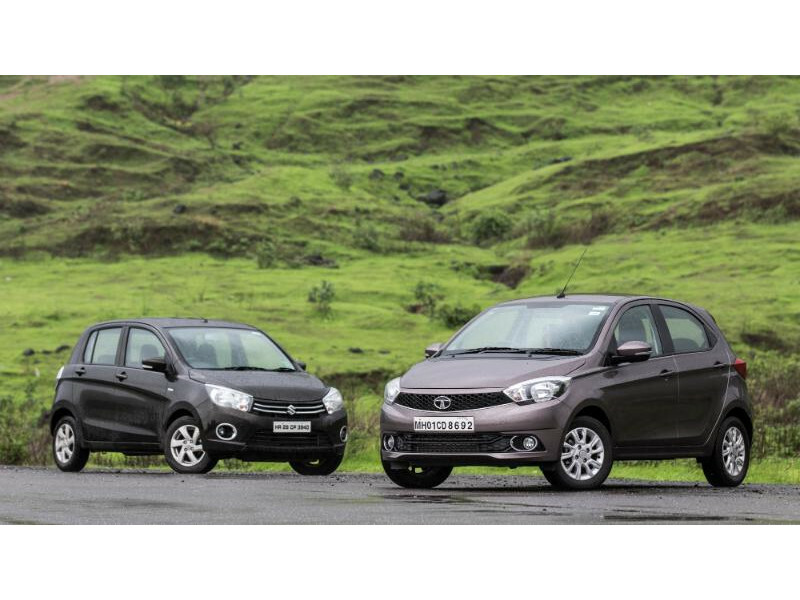 Crux: Celerio vs Tiago price war goes in the favour of Tata Tiago. Tata Tiago Comparison to Maruti Celerio remains largely a one-sided affair. The former offers better value for money. It has got the looks, frugal engines and an impressive feature list to match. Add to that the fact that Tiago undercuts Celerio by a considerable margin and you get a clear winner in this Tata Tiago vs Maruti Celerio comparison. The only saving grace for Celerio is its better performing engine and Maruti’s strong after sales service network.